Welcome to part two of Sussex in the Fa Cup where we are keeping tabs on our local football teams as they progress deeper into FA Cup history, writes Colin Bowman. After an astonishing Firsy Qualifying round we have no less than 10 clubs taking their place in the next round tomorrow (September 22). For some it will hopefully be a regulation passage into the hat but for others this Saturday could represent their cup final. 1) AFC Uckfield Town v Dartford, The Oaks, 3pm kick off. AFC Uckfield of the our local SCFL County Team have been handed a dream home tie against Dartford FC of Conference South. Since they won the previous round Uckfield social media has gone into overdrive and interest around the club and town have gone into the stratosphere. There is no doubt that the club face their greatest ever challenges both on and off the pitch. With perhaps over 250 visiting supporters a large home contingent and some visitors from Norway converging on the stadium resources will probable be stretched to the limit. Dartford will travel to Sussex as huge favourites for the game. As a Burgess Hill Town fc fan I do know a thing or two about these guys! 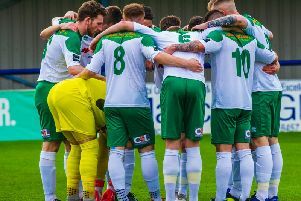 Hillians manager Ian Chapman is no stranger to FA Cup success with Burgess Hill Town (Bostik Premier). Over the past five seasons we have enjoyed a whole myriad of magical cup moments. Who can forget a brilliant day at Sutton United when Ian drove his team to a three one victory. After beating Folkestone in the previous round most of us wanted a nice home draw but the balls had other ideas! It doesn’t come any harder than Hampton on the road. The hosts are flying high in Conference South and are winning games for fun. They recently travelled to Truro and picked up a two nil win. It seems that after an early season wobble they have become very mean in defence so scoring goals against them could be very difficult. Mid Sussex outfit The Wasps (Bostik South East) of EG travel to Essex to face an inform Hormchurch side (Bostik Premier). Indeed, the hosts remain unbeaten in the league with one win and no less than six draws. It’s a different story for the Wasps who have found it hard going in the league with just three points from 15. It will be very interesting to see if manager Matt Longhurst can pull off a stunning win. Hastings FC (Bostik South East) have a very proud FAC History and under manager Chris Agutter they will be desperately trying to progress to the next round. Unfortunately, they are going to have to do it the hard way by travelling a long distance and also beating higher opponents in Leiston. Having travelled to Victory Road Suffolk myself a warm welcome is guaranteed for Hastings fans and it’s a great little stadium. Leiston now operate in the notoriously difficult Southern Premier league but are sitting pretty in 3rd position. Its going to be a very tough day all around for Hastings connections but they are second in Bostik South East. I predict a right old humdinger and perhaps a replay at Pilot Field. The Ultra’s of Whitehawk will travel in big numbers to Essex and will make a right old dim at the Rookery. It’s a path well-trodden as both clubs have played each other many times over recent times in Conference South. However, Whitehawk now operate in Bostik Premier so its going to be quite a test for young manager Jude Macdonald and his team. However, it’s a challenge which I believe the Hawks will succeed. Horsham recently promoted to Bostik South have had a good start to the season. Due to home improvements they are currently sharing grounds with Lancing Fc at Culver Road. The Swifts of Malden Essex will travel with two league victories under their belt and will be looking to progress. However, I just feel that the Sussex team will hold all the aces, including an artificial pitch and will progress. Eastbourne Borough (Conference South) manager Jamie Howell will know that his team face a real banana skin when that travel to Suffolk to face Eastern Counties Brantham Athletic. The hosts are mid table in their league but do seem to be reliable on home turf. However, the Sussex club are having an excellent start to the season and you feel that with their talented squad they should be heading back to East Sussex with a comfortable win. Chelmsford are an established and well-respected Conference South club and will be very difficult to play against especially at home. However, things are going from strength to strength for Adam Hinshelwood at the Rebels and you feel that Worthing Fc could take victory in Essex. You hope that Bostik Premier high-flyers should be holding all the cards against a lower ranked Sudbury. Home turf, large Sussex support and excellent form should take the Rocks through to the next round. Hopefully the home banker of the round. All that remains to say the best of luck to all ten Sussex teams who will be going into FA Cup battle on Saturday. The Cup can be both exhilarating and brutal in equal measures with unexpected results at every turn. Its therefore very tough to predict anything with any certainty but I will stick my neck out and say that at least seven of out terms will be in the Third Qualifying Round.